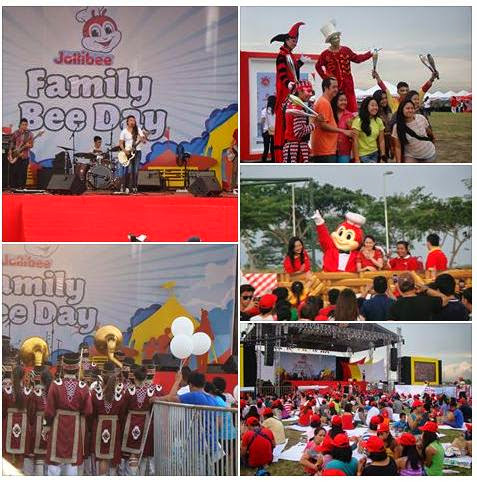 Jollibee held its grandest picnic at the Nuvali football grounds in Sta Rosa, Laguna earlier today. “We are very excited to mount an event of this magnitude that celebrates the Filipinos’ love for bonding over good food. We are very happy with the turnout and pleased to see everyone enjoying the company of other people whom they treat like family. Talagang dito sa Jollibee, ang sarap maging pamilya,” said Jollibee vice-president for Marketing Harvey Ong. Local stilt walkers and jugglers paraded around the Nuvali grounds to entertain. Families posed and had their pictures taken by the giant picnic basket and oversized photo frame walls. There were also photo opportunities with celebrities like Regine Tolentino, who came with her family to join in the picnic at Nuvali grounds. The kids had a grand time playing at the inflatable slide and basketball shootout, not to mention the overflowing Jollibee treats. Jollibee raffled off exciting prizes much to the delight of the audience. There were exciting dance performances from Jollibee and friends, plus Jollibee Kids Club members. Moonstar88's live band performance was awesome! Marian Rivera and Erik Santos top-billed the list of performers who entertained the Nuvali crowd. Similar Family Bee Day celebrations were held at the Quirino Grandstand in Metro Manila, Bayanihan Park in Pampanga, Plaza Independencia in Cebu and Crocodile Park in Davao as well. This grandest picnic in five venues nationwide provided a good venue for families to commemorate Mother's Day. The moms were handed out white balloons at the end of the event. Thank you, Jollibee for a wonderful afternoon!